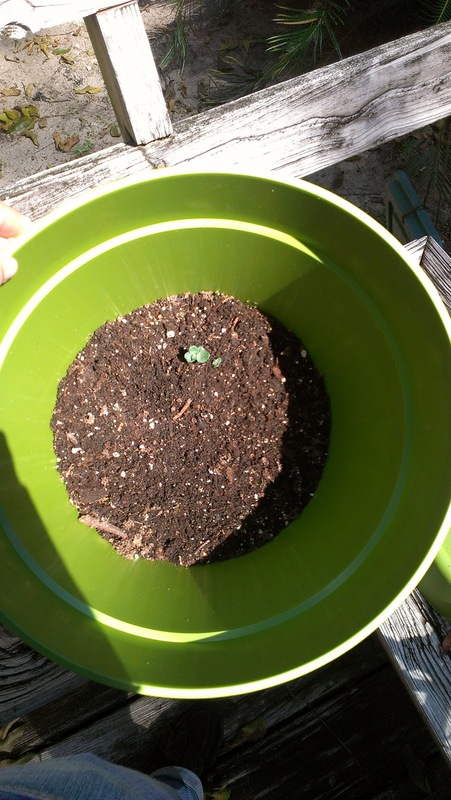 Weirding with Wisdom: The start of the Itty Bitty Garden! The start of the Itty Bitty Garden! Well I've got my "Itty Bitty Garden" underway! By itty bitty garden, I mean the small container garden I've been planning since summer. Of course its currently getting into Fall, so my little containers are being kept inside for the most part. This is Florida, but the temps are still getting down to the low 50's at night. Especially when winter gets underway, I'll bring everybody inside overnight. However, I do have a few small pet projects going on, indoors, for now! 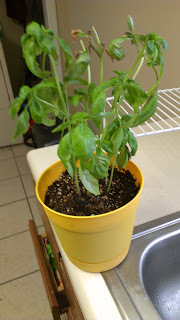 The first one is this here little Basil plant I actually bought at the grocery store. 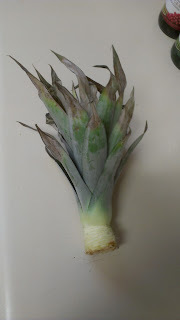 I've already lost one stalk, and some of the other ones are looking a bit puny, with leaves browning and falling off. 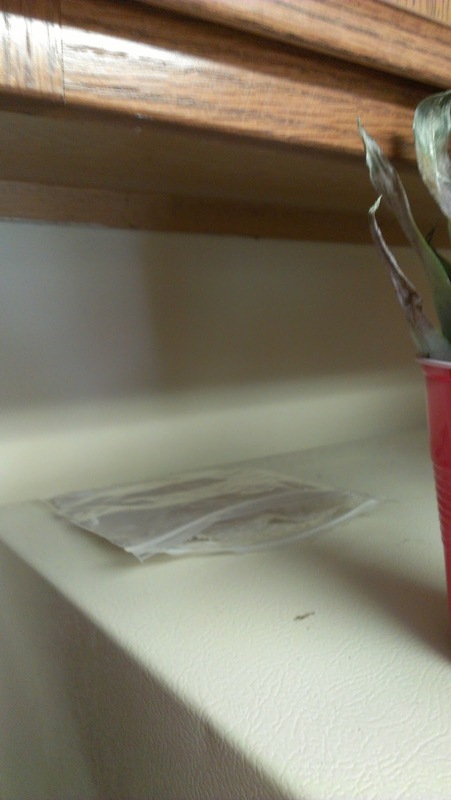 However I have gotten a bit of use out of it, and it is still sending off new growth, so there might be hope for it yet. I hear that Basil doesnt like the cold, though, so I've had to keep it inside and it might not be getting all the sunlight it needs. Well.. fingers crossed. A few weeks ago I ordered a bunch of seeds. I havent planted many of them since its getting colder out, but with this one in particular I had no patience. 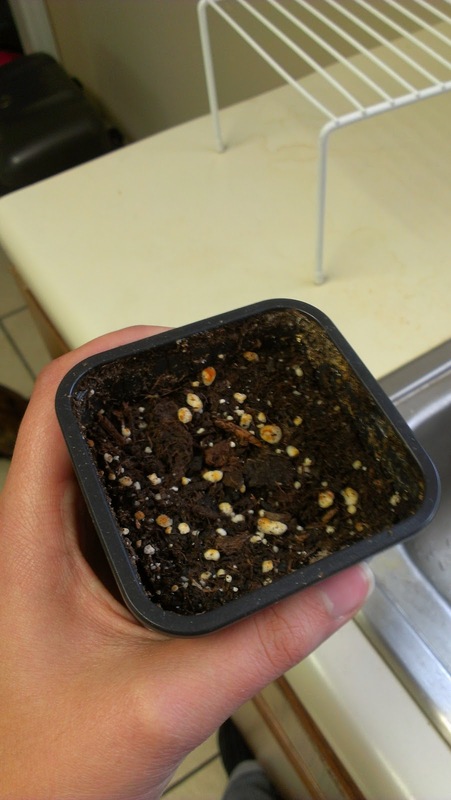 I wanted to try growing a Lavender plant, which was probably a little too much for a beginner like me. Well, first off, if you werent aware, Lavender seeds are TINY. Like, microscopic. So I'm not even sure exactly how many seeds I ended up planting. I just sort of stuck my finger into the pile, and brushed whatever was sticking to my finger into the dirt. Well its been a few weeks as I mentioned, and still nothing, as you can see. I'd definitely be lying if I said I wasnt disappointed. If anyone has any advice for growing Lavender, please let me know! I want this to work so badly! My next project was this guy in the big green planter here. I had a bunch of little potatoes from the grocery store a while back, and not all of them got used. Of course the ones that were sitting in the pantry for weeks started to sprout, so I figured, hey, why not try and grow them? I picked out three of the healthiest looking ones with the most sprouts and stuck them in this here planter. As you can see, only one of them has actually made any progress. I'll probably remove the two that havent sprouted yet soon (and toss them in my Vermicompost bin!) so they dont start rotting in there. But that one little sprout in there gives me hope! This is the one plant I've been keeping outside all the time, since the planter is rather large and I dont have space for it inside. But its growing! We'll see how it goes! 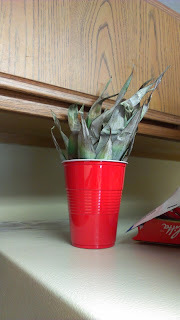 So this guy here is a pineapple we bought a few days ago. When it was fully ripe I cut it up and its now in the fridge. (I also made some cookies with some of the pineapple.. that was a bit strange.) 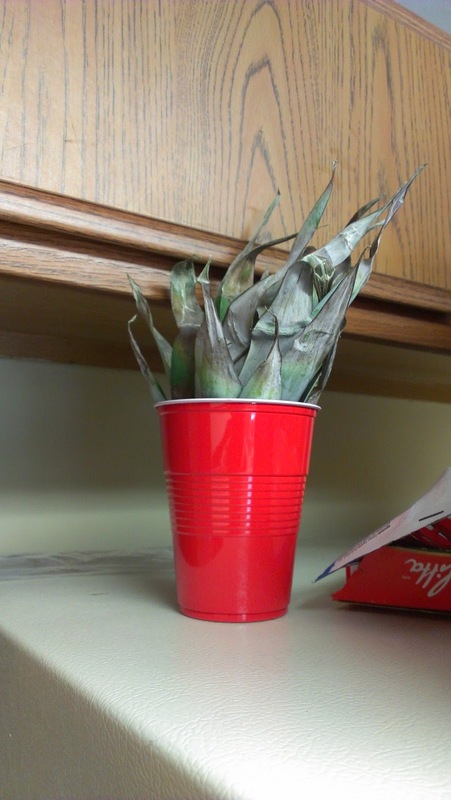 The leftover stalky bit I didnt want to just throw away, and I've always wanted to try growing my own pineapple! So I went ahead and followed the instructions on this website. The pineapple I used may have been a bit over-ripe (you can see in the first pic the tips of the leaves were starting to brown) but it had plenty of root primordia, as you can see in the second picture, so I decided to give it a go. Whats the worst that could happen, it not work? Exactly! I had it sitting out to dry for a few days as the website suggested, and just today placed the crown in a cup of water. You can see it in the picture to the right, sitting on top of my refrigerator. Now to wait three weeks.. Ooo this gardening thing is really testing my patience! But, fingers crossed for roots to show up! And last but certainly not least, these little guys! 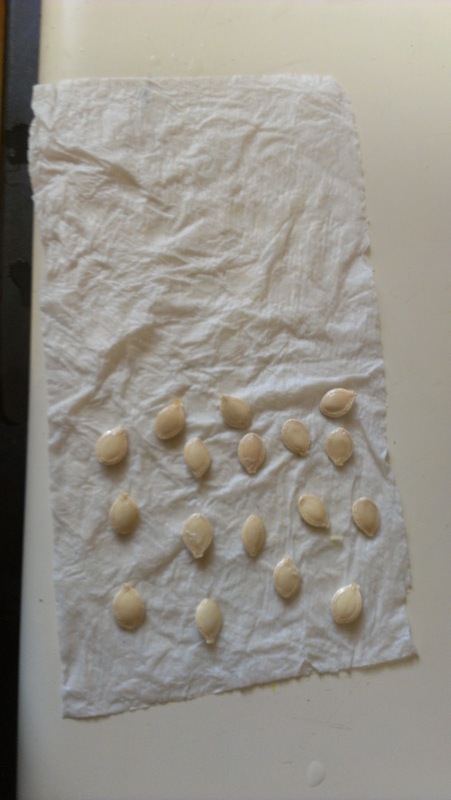 You might recognize these as Squash seeds. They came from the Spaghetti squash we had for dinner last night! (By the way, I definitely strongly recommend spaghetti squash in place of pasta. It is so good!!) 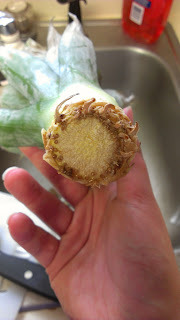 I noticed when I cut into it that a few of the seeds had started to sprout inside! Unfortunately, those little sprouts got damaged when we were cutting into it and I scooped out the goopy bits. But it gave the the idea to try germinating some of the other seeds! 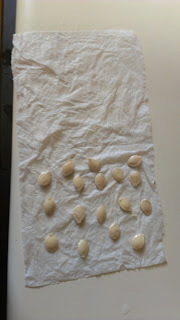 So first, I picked out a few of the bigger plumper seeds and rinsed them off. 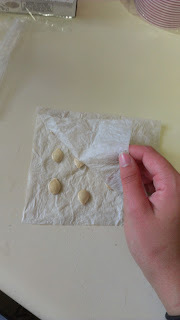 Then I put them on a damp paper towl, as pictured here, and folded it over so they would be covered. Then I stuck this little seed/paper towel "taco" into a little ziplock back. This will hold in moisture. 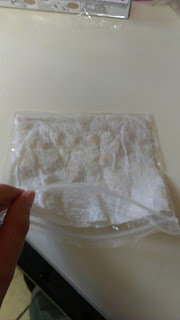 I didnt "zip up" the bag, though, so that the paper towel and seeds could "breathe" and wouldnt get mouldy and gross. And I stuck the bag up on top of the fridge where it gets sort of warm, and where it would be out of the way. I'll check on it periodically for germination. Fingers crossed! !